Over the past couple of years, unmanned aerial vehicles (UAVs or ‘drones’) have become a vital tool for the surveying and mapping industry. Equipped with a variety of sensors, they add a new dimension to the capture of geospatial data. Drone technology is developing rapidly, but the UAV itself is not the only thing that counts; the type and quality of data collected also depends on the payload. This section of our website informs you about the latest trends in the field of unmanned aerial mapping relating to capturing, processing and visualising the data in various mapping applications. In-depth articles, case studies, interviews and columns will provide you with new insights regarding the professional use of UAVs. 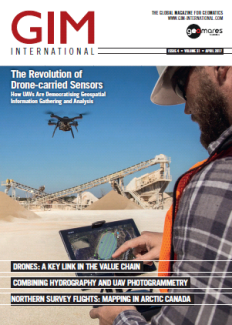 Read the April 2017 issue of GIM International, which has a special focus on UAVs. GIM International and other surveying and mapping literature, there have been many articles describing the use of UASs, new developments and precautions that need to be taken to achieve satisfactory results. Read the full story here.